toybot studios: Shikaruna x Lulubell Toys New Years Exclusives...!!!! Shikaruna x Lulubell Toys New Years Exclusives...!!!! 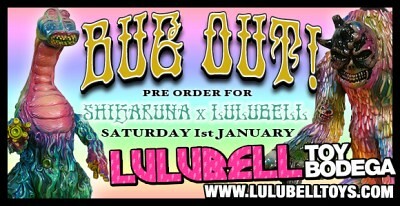 Shikaruna x Lulubell ring in the New Year with 2 insane new exclusive versions of Chiwos & Dorol! Chiwos is cast in mint green vinyl while Dorol was done on a white vinyl base. As is signature, both are covered in tons of amazing colors! Uber-limited! PRE-ORDER opens up January 1st, 2011 @ 5pm pacific! Nice price of $99 each! Here's wishing you all a healthy, joyous & prosperous New Year! From both sides of the globe, Luke & I extend our sincerest appreciation to each & every one of you for your support in 2010, and for keeping this dream alive another year! We are working hard to bring you exciting new sculpts in 2011, as well as continuing to bring you more of your favorite usual suspects! MISHKA x L'amour Supreme x NAG3 2011 Release...!! Max Toy Co. 5th Anniversary Events...!!!! COOP x NagNagNag Boryoku Genjin...! NERD ONE Stereogon Blind Bag..! BLObPUS x Yamomark Blind Bags..! LOVE MOVEMENT Custom Toy and Art Show VIDEO..! LOVE MOVEMENT Custom Toy and Art Show RE-CAP..!!! KAWS x Robert Lazzarini Companions...!! New Works from Carlos Enriquez-Gonzalez!!!! 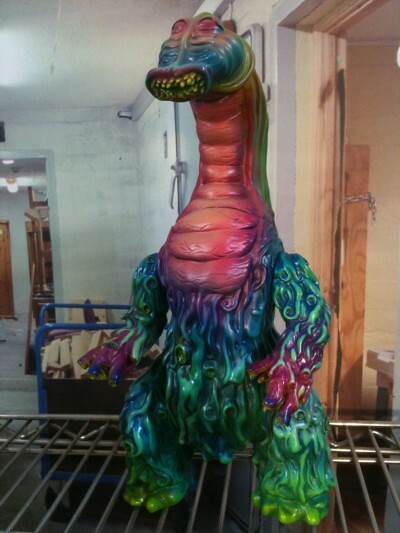 L'amour Supreme Custom Voltron Mongolion..! Brian Ewing Midwest Book Tour...!! New Toy: Cosmicat Robo by P.P.Pudding...! toybot studios does LOVE MOVEMENT....!!! Bizaar Bizarre this weekend at Fort Mason..! Brandon Peat's A is for Ackbar...!!! Touma x Phalanx Studio Power Mazinger...!! MONSTREHERO .GIFs by Kevin Ernst..! El Manpo: New Cosmo Liquid Garage Toy...! Gargamel Exclusives for Rotofugi Show...! Dead President x Callgrim.... Too Late..! New Blade II Lithos by Mike Sutfin...!!! Tattoo Royale Launches Web Store...!!!! New Super 7 Drops for December..!